Is it OK to Feed Raw Dog Food to a Dog With Cancer? Raw dog food for dogs with cancer – Is it OK to feed raw dog food to a dog with cancer? I recently learned that raw dog food isn’t ideal for most dogs affected by cancer. 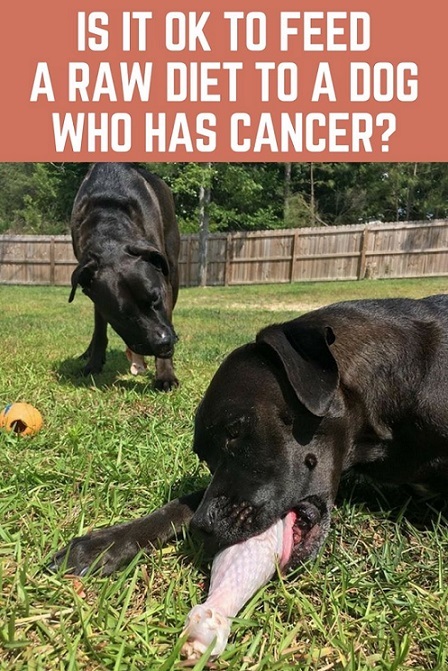 When a dog’s body is weakened by cancer, she has a hard time digesting raw cuts of meat and raw foods in general, according to Dr. Demian Dressler’s Dog Cancer Blog. Several light bulbs went off in my head when he mentioned one of the symptoms of doing poorly on raw when affected by cancer is diarrhea. My cancer pup Missy has had some sporadic runny poops these last few weeks before I learned her cancer was back. Her cancer has returned 3 years after the first tumor was removed. If your dog has cancer, Dr. Dressler’s advice is to lightly cook your dog’s food. Taking Dr. Dressler’s advice to heart, I’ve had to slightly adjust meal prep in our pack from filling two bowls with cuts of raw meat to just one. Since my other dog Buzz is healthy, he has no trouble digesting his raw food and continues eating and thriving on it. My cancer patient Missy on the other hand now needs to have her food lightly cooked. Interestingly enough, the diarrhea she was having stopped almost as soon as I began feeding her cooked food, so Dr. Dressler seems to be on to something! 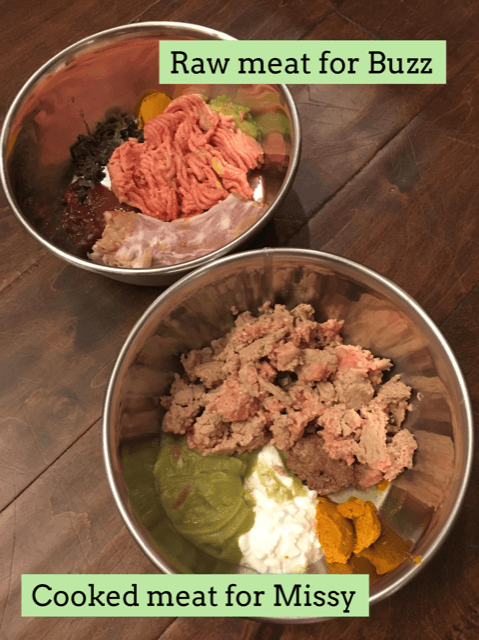 Food pic (above): Buzz’s raw food bowl contains a turkey neck, ground turkey, calf liver, some of Missy’s puréed veggies, turmeric past and air-dried green tripe. Missy’s bowl contains lightly cooked ground turkey, cooked calf liver, boiled/puréed veggies, cottage cheese and turmeric paste. The base of Missy’s meals still consist of muscle meat and organs, but instead of being offered raw, I now cook them on low heat in a pan. Following Dr. Dressler’s advice, I also started giving her a good amount of boiled, puréed, non-starchy veggies with each meal. I learned that carrots and potatoes need to be avoided as they are high in carbs which turn into sugar, which in turn feed the cancer. I’m being very strict about following that rule. I never believed in feeding potatoes either way, but the pups DID get some carrots every now & then, which is now a thing of the past. So for the past 2 weeks, Missy’s been having a mix of broccoli, brussels sprouts and shiitake mushrooms, and totally loves it. I’ll be alternating between those. I also learned that brown rice is an excellent source of energy for canine cancer patients. Unlike potatoes and carrots which are simple carbs, brown rice is a complex one, meaning it’s higher in nutrients and fiber, and takes longer to digest. Its bran (the outer layer) is also rich in polysaccharides which have cancer-fighting properties, so I AM essentially breaking my very own rule of not feeding grains. Then again, my grain-free diet conviction is geared towards healthy, cancer-free dogs, so I’ll trust the professional’s opinion on brown rice being beneficial for dogs challenged by cancer. I started supplementing it with the kratom we’ve been recommended (sacredkratom.com/buy-kratom/) for the full effect. In case you’re wondering, Buzz is not getting any brown rice with his raw meals. I have a feeling that grains might have been an underlying cause of his frequent ear infections he suffered from prior to eating raw cuts of meat. Since he hasn’t had a SINGLE ear infection since eating raw, I’m not taking any chances of reintroducing those. What about raw meaty bones? 1) Hold the raw meaty bone under warm, running water for several minutes until it has warmed up, then offer it to her whole as usual. 2) Replace the raw meaty bone with cottage cheese, which is a great source of calcium, and which Dr. Dressler recommends to be included in every meal. While I have been giving her a tablespoonful of cottage cheese at mealtime, I’ve also still given her 2 raw meaty bones each week as I still want her to experience the oral benefits that come with eating them. See my post: How to safety feed your dog raw bones. 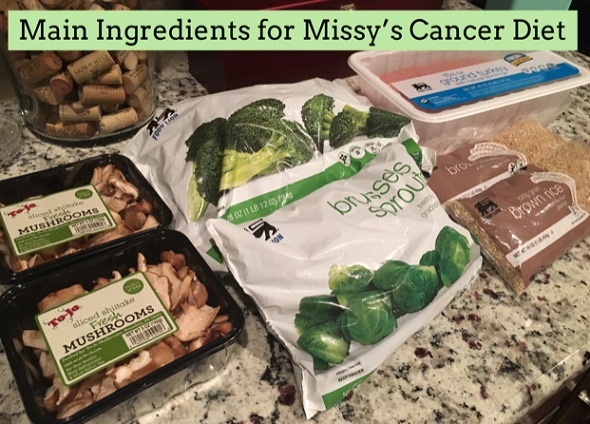 During the duration of Missy’s cancer treatment, I’ll be stepping her nutritional needs up one more notch by getting her a customized meal plan and homeopathic preparations from a local homeopathic veterinarian, Dr. Charles Loops, who’s practiced alternative medicine for over 20 years. I’ve heard great things about him and one of my favorite holistic veterinarians, Dr. Karen Becker, even interviewed him on the use of nosodes in lieu of vaccinations. What are the odds of him living in our neck of the woods?! I will add that 95% of his consultations are conducted over the phone, so if you don’t live here in North Carolina and are interested in getting his opinion on a medical issue your pup may be experiencing, you can easily do so. My goal in looking into this alternative approach is twofold. I want to maximize Missy’s life expectancy as well as offer her the best quality of life I can. I realize that Missy may succumb to this second tumor. However, I’ve heard stories of cancerous dogs supplemented with homeopathic remedies whose life expectancies drastically exceeded those predicted by their oncologists. So I’m definitely giving this alternative treatment approach a try. Until then, we’ll continue feeding Dr. Dressler’s cancer diet of lightly cooked protein, boiled & puréed veggies, brown rice and cottage cheese. P.S. I’d like to thank That Mutt’s community for taking an interest in Missy’s cancer diagnosis and expressing support by wishing us well. You guys rock! 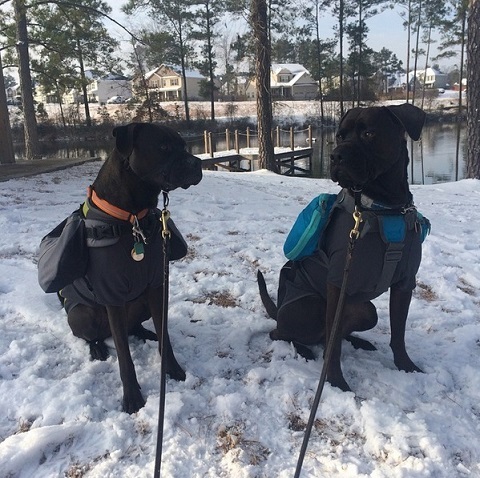 Barbara Rivers writes regularly for That Mutt about feeding her two boxer mixes a raw dog food diet. She is a blogger and dog walker and maintains the blog K9s Over Coffee. ThatMutt’s community is a great one. I admire the effort and thought and care you’re bringing to this whole situation. Your philosophy of focusing on quality and quantity of life is a good one. Your willingness to be flexible and continue adjusting your approach based on Missy’s needs is the best strategy, in my opinion. We’re sending you all, all kinds of good wishes. Thank you so much, Julia!! I’m willing to broaden my horizon and learn, learn, learn! I’ll share the results with the community here and on my blog. I have a dog with cancer, totally raw no carb, I’ll see if I can get the brown rice bran only to add since you say the bran has an anti cancer effect. Well, I saw Dr. Charles Loops this morning, and asked his opinion about the brown rice. He does NOT recommend it, so I’m going to trust his 22+ years in the homeopathic veterinary field and scratch brown rice again. He said the polysaccharides do not trump the fact that brown rice is a carb that would be feeding the cancer. What kind of cancer does Gamer have? I’m starting Missy on Dr. Loops’ homeopathic protocol tonight, and also went ahead and ordered Darwin’s raw food cancer line, as Dr. Loops recommended it. I’ll try feeding it to Missy raw and see how she does on it. I can always lightly cook it. Ahh, bummer on the rice. I guess there are always going to be different opinions. What Dr. Loops said makes sense. I’m so glad Missy has so many people helping her! Thank you Lindsay, she does have a growing support team 😉 I agree that Dr. Loops’ view of the brown rice makes sense. It was kind of funny when he pulled the Darwin’s raw food out of a freezer to show me the brand, and as soon as I got a glimpse of the unique packaging I knew it was Darwin’s and told him that they were the very first commercial brand of raw food that I started our raw journey with! Please keep us updated on Missy’s condition. I am praying for your family. Just give her all the kisses you can and know she appreciates every moment she’s ever had with you and your family. Know that she knows how loved she is. Thanks for thanking me for pointing you to the website of dog cancer blog. But I am a female (that is okay I realize Chris can be a boy or girl name). I am glad you could find the website helpful. Too many of our dogs are getting cancer and I am glad there are websites out there to help. I really did find it helpful – I’m just going to omit the brown rice for now. when Evie was going thru her chemo treatments, they did not want her on raw. both of my vets, the cancer vet and my reg vet, said the raw could interfere with the chemo. I think it would also interfere with radiation but she could not go under sedation to have radiation. my reg. vet is a homeopathic vet as well. Evie passed away in Aug of histiocytic sarcoma. I’m so sorry you lost Evie to cancer. Did you have her on a home cooked diet during her treatment? Our homeopathic vet recommended a particular raw cancer support diet but said that it can also be lightly cooked. I went ahead and ordered it and have been cooking it a little as Missy does seem to do better on it that way. I’ll be writing about that line of food in my next post here on ThatMutt. it was partially home cooked, raw venison, human grade, steamed veggies (peas, baby carrots and kale) and holistic select kibble, goat’s milk, plain greek yogurt. I was told by both vets, the cancer vet, Dr. Russlander at vsh and my homeopathic vet that the raw foods could interfere with the chemo and some of the meds she was on. I had to eventually go to soft foods, and even baby foods for her, i had to hand feed her. she was also on the mushroom therapies and one other homeopathic supplement that the vets ordered. both were rather expensive, but I did not care. as long as she was not in any pain, which they said she was not, I was willing to pay anything.